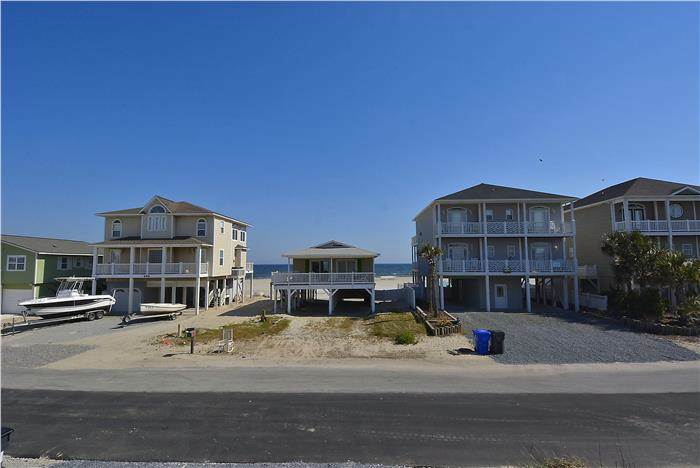 Soak in the inlet and ocean views from the porches of this 4 Bedroom, 2 Baths home with 13 x 29 POOL! Huge flat panel TV in the main living room, flat panel televisions with bluray players in each bedroom. WiFi, ceiling fans. Well equipped kitchen with dishwasher, stackable washer/dryer, microwave. Sundeck & covered porches with furniture, Hot/Cold outside shower. Private deck off master bedroom with views of the pool and the inlet. Sleeps 10. Bedding - Downstairs: Double, Queen, Queen Sleeper Sofa. Upstairs: Queen, Queen. Linens and bath towels provided. (NO LINENS DURING WINTER MONTHLY RENTALS) Non - Smoking. Dog Friendly only with additional non-refundable pet deposit. This house has the most gorgeous ocean views of any house we have ever rented from any beach! You can look out any window in the house and see gorgeous views of the ocean, the inlet and the intracoastal waterway. There is plenty to do on this end of OIB and we spent alot of time walking our two dogs and exploring this end of the island. It was the perfect place to have your pets. The house on the inside was nice and had everything we needed to enjoy our vacation. There is also the added perk of a beautiful pool behind the house that had plenty of wonderful pool furniture. We loved the pool and the location of the house. We would love to stay in this house again next year. We do have a couple of recommendations that we think would make the house even more perfect than it already is. We would recommend new mattresses and new comforters or bedspreads for the beds. We would also recommend some fixing of the side door which did not work and fixing the light switch located beside the side door which did not work correctly. There also needs to be a light on the front stairway going up to the house and the countertop in the kitchen needs to be fixed. All of this was minor however. We enjoyed our week in this house and would rent it again. Thank you for sharing your positive experience. We are glad you enjoyed your vacation! The maintenance items have been reported and will be addressed. Thank you! Perfect vacation house for 4 adults and 4 children to make beautiful memories together. A hot cup of coffee in the morning and an adult beverage in the evening with a beautiful beach view from the covered front porch was so relaxing and memorable. We all enjoyed the pool through out the day especially when it was too windy on the beach. The pool was really nice its the perfect size and depth. The fence really helped with blocking the wind. The house has every thing you need it even had some board games, puzzels and children's books. It was clean and the beds were comfortable. It was quite and safe. We enjoyed bike rides and walks up and down the street. The only thing it could use is a charcoal grill and a heavy duty dryer. We brought our grill from home and the dryer works but it just takes forever to dry cloths. You have to run a small load of cloths through several drying cycles. But, it's really a wonderful vacation home and we plan on staying there every year. We tell everyone they should stay here at this house. It's a great place to bring your pets as well but we didn't take ours this time. They stayed at the doggie resort and had there own little vacation. Thank you for such a wonderful, affordable and memorable family vacation home that we can enjoy for years to come. Simple with all you need just bring family. The house is real nice,love the front porch and the view.but the pool was the best.hope to stay in this house on my next vacation at ocean isle. Great quiet location on the end of the island. Great access to the beach and nice pool for the non beach folks. A few small needed repairs and upgrades on the house that can be looked past for a weeks stay.